Hello! This is for today's Try a New Technique Challenge on SCS to make a Crimped Envelope Pocket Card. I don't have a crimper, so I had to improvise by scoring the envelope : ) I used this fun sprig of blueberries from the Artful INKables set Berry Picking. I colored the image in with Copic markers, cut it out and popped it up with foam squares. The edges of the envelope were sponged with Old Olive. The striped dp is from SU Urban Garden dsp. I added a scalloped edge to the "lid" of the envelope and 3 buttons. The sentiment was punched out with a SU Oval punch and sponged with Old Olive. I then popped that up on another oval punched out of Night of Navy. 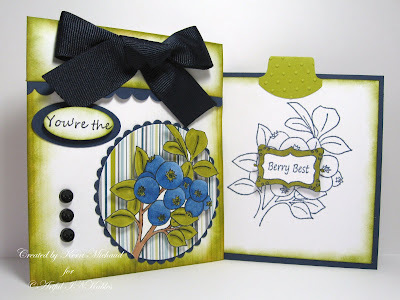 For the insert, I stamped the blueberries with Night of Navy, stamped the sentiment, cut it out, and popped it up on top of the blueberry image. The edge was colored with a Pale Olive Copic marker. I added a tab punched with the SU Round Tab Punch and added some texture to it with the CB Swiss Dots Folder. I hope you like it, and thank you so much for stopping by today! This is gorgeous!! I love the vibrant coloring and the berries up against the stripes. This is so clever! I just love it! the colors, the design, the elements! WOW! Oh I do love this! The blueberry stamp is sooo cool and your coloring of it really is fantastic! I also love the outline stamping on the insert!I love the tab on the insert and the colors you used really rock! I love this one!!! You do great work!!! This is adorable. I love how the image inside is just left as the outline and the outside images is a riot of color and texture!